Ideal back support to provide thoracic, lumbar, sacral support of the back. Soft shell with semi-rigid thermoplastic inserts in the front and back panels provide excellent circumferential truck support. 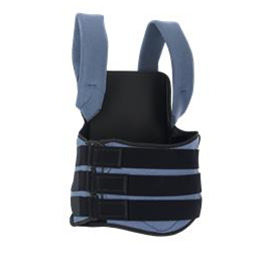 Excellent back brace for patients with significant truck weakness affecting the lumbar, sacral, and thoracic spine who would benefit from significantly improved trunk alignment. Orthotic therapy for patients who require lumbar, sacral, thoracic support of the spine. Soft outer shell provides a moisture wicking, breathable TLSO interface which is excellent for patients with potential skin integrity issues. The TLSO is a two-piece spinal orthosis with a front and back panel. The two panels have hook and loop closures to facilitate easy device application. Three circumferential straps provide inter-abdominal cavity compression to enhance TLSO support. Two shoulder straps are used to maintain proper shoulder and spinal alignment and to prevent forward slouching in the brace. Semi-rigid posterior and anterior panel thermoplastic inserts provide the support for the thoracic, lumbar, sacral spine. If necessary, the semi-rigid inserts can be heat molded to customize the supportive alignment of the TLSO. TLSO can be worn under or over the patient’s clothes. Most patients wear the device over their clothes. Reg/Short OP 61TLSO-RS 30" - 36" 8" - 10"	13" - 15"
Reg/Tall OP 61TLSO-RT 30" - 36"	11" - 13" 16" - 18"
Full/Short OP 61TLSO-FS 37" - 42"	8" - 10" 13" - 15"
Full/Tall OP 61TLSO-FT 37" - 42"	11" - 13" 16" - 18"